Alexander, mobile and skilful for a big forward, has gone on to specialise as a tight-head prop for his country. 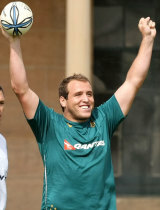 Alexander made the amazing achievement of starting in an international match before ever starting a game in Super Rugby when he debuted for Australia in November 2008. The prop locked down his starting spot in the Wallabies team during the 2009 Tri-Nations, completing his meteoric rise to prominence. After joining the ACT Brumbies academy in 2008, Alexander quickly started to feature for the Super 14 side, and in 2009 played in every match for his side, scoring three tries. Alexander's development showed no signs of curtailing and he went into the 2010-11 season as Robbie Deans' first choice tight-head. He started all four of their games during their northern hemisphere tour and kept his place in the front-row for the 2011 Tri-Nations. Deans looked to Alexander for front-row stability during the 2011 World Cup as he made six appearances in the tournament.